The Texas Rangers visit O.co Coliseum on Friday to play the Oakland Athletics. The probable starters are Cole Hamels for the Rangers and Kendall Graveman for the Athletics. The opening line for this matchup has Texas at -142 and Oakland at +132. The over/under was set at 7.5. The Rangers have a 76-69-8 over/under record and a 78-75-0 run line mark, meaning they cover 51% of the time. The Athletics are 86-66-0 against the run line and have a 69-78-5 over/under record. They cover the spread 57% of the time. The Rangers head into this matchup with a 90-63 record, including 40-38 on the road. Starting pitcher Cole Hamels has a 14-5 record with an earned run average of 3.42 and a WHIP of 1.32. He has 187 strikeouts over his 186.2 innings pitched and he has given up 171 hits so far this season. He has allowed 8.2 hits per 9 innings and he has a FIP of 4.07. The bullpen this year has an earned run average of 4.63 and they have given up 498 base hits on the year. Teams are hitting .262 against the bullpen while being struck out 401 times and walking 179 times this season. As a team, Texas has allowed 9.01 hits per nine innings while striking out 7.16 batters per nine. They are 24th in the league in team earned run average at 4.44. The Rangers pitchers have collectively given up 1,364 base hits and 672 earned runs. They have allowed 194 home runs this season and they allow 1.3 homers per nine innings as a staff. Texas as a pitching staff has walked 511 batters and struck out 1,084. They walk 3.4 men per 9 innings while striking out 7.2 per 9. They have a team WHIP of 1.38 and their FIP as a unit is 4.63. As a team, Texas is batting .264, good for 4th in the league while putting together a .247 average away from home. The Rangers hold a .436 team slugging percentage and an on-base percentage of .324 which is good for 12th in baseball. They rank 7th in baseball with 9.01 hits per game. Adrian Beltre comes into this game hitting .299 and his on-base percentage is at .358. He has 167 hits this season along with 84 runs scored and 98 runs batted in. He's struck out 64 times and has walked 47 times. Ian Desmond is hitting .287 and he has an on-base percentage of .338. He has totaled 172 hits so far while scoring 104 runs and he's driven in 84. He has walked 43 times and has struck out 152 times. The Rangers have 1,379 hits, including 241 doubles and 204 home runs. They've stolen 91 bases while they've been thrown out stealing 34 times. Texas has walked 416 times this season and they've struck out 1,148 times as a unit. They've left 986 men on base and have a team OPS of .760. They score 4.78 runs per contest and have scored a total of 731 runs so far this year. Oakland comes into this matchup with a 33-45 home record and a 66-86 overall mark. With an earned run average of 4.21, Kendall Graveman has a 10-10 record and a 1.33 WHIP. He has 99 strikeouts over the 173.1 innings he's pitched during which he has given up 185 hits. He has allowed 9.6 hits per nine innings and his FIP stands at 4.48. So far this season the bullpen has an earned run average of 4.03 and they have given up 491 base hits on the year. Teams are hitting .243 against the Athletics bullpen while being struck out 500 times and walking 182 times this season. As a team, Oakland has allowed 9.18 hits per nine innings while striking out 7.48 batters per nine. They are 25th in the league in team earned run average at 4.51. The Athletics pitchers as a team have surrendered 1,375 base knocks and 675 earned runs so far this season. They have given up 171 home runs this year and they give up 1.1 home runs per nine innings as a staff. Oakland as a staff has walked 446 hitters and struck out 1,120. They give up a walk 3 times per 9 innings while they strike out 7.5 per 9. Their team WHIP is 1.35 while their FIP as a staff is 4.22. As a team, they are batting .247, good for 24th in the league while putting together a .235 average at home. The Athletics hold a .396 team slugging percentage and an on-base percentage of .305 which is good for 28th in baseball. They rank 25th in baseball with 8.38 hits per contest. 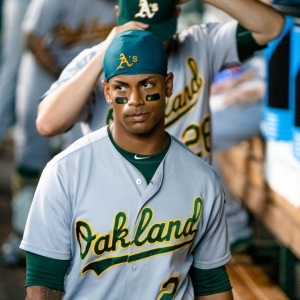 Khris Davis comes into this matchup batting .252 and he has an OBP of .307. He has 132 hits this year along with 82 runs scored and 99 RBI. He's struck out 155 times and has walked on 36 occasions. Danny Valencia is hitting .288 and he has an OBP of .349. He has collected 128 hits so far while he's scored 72 runs and drove in 51. He has earned a walk 40 times and has punched out 107 times. The Athletics as a unit have 1,274 base hits, including 247 doubles and 161 homers. They have 48 stolen bases while they've been thrown out 22 times. Oakland as a team has walked 415 times this year and they have struck out 1,068 times. They've had 976 men left on base and have an OPS of .700. They score 4.1 runs per game and have totaled 623 runs so far this season.